Dancing for God After Fifty is full of sound, biblical teaching concerning the ministry of dance in the Church today. If you desire to experience a fresh anointing on your life and ministry, this book promises to lift the veil and allow you to enter the Holiest of All ~ His glorious Presence, where He ministers SPIRIT to spirit! Whether you are starting a dance ministry or you are a well-established minister of sacred dance, Dancing for God After Fifty will take you to a new level in Christ! Pastor P.K. Roberts shares how through the power of the Holy Spirit, the tiniest feet can leave the largest footprints in the souls they come in contact with. 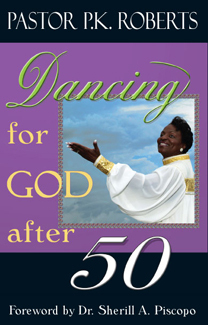 If you are hungry for a fresh experience with God, Dancing for God After Fifty is for you! But beware! After you devour a few chapters of this book you may never again be willing to stay with the spiritual status quo. Pastor P.K. Roberts truly has a pastor’s heart, preaching and now dancing at conferences in the United States and abroad. She has served 19 years as a military chaplain. She is also co-founder of International Soaring Eagles Ministries, with her husband Elisha. They reside in Selfridge, Michigan.